Momma always said "Life was like a box of chocolates... You never know what you're gonna get. Choose a 1 out of 9 chocolates to receive your daily prize such as coins, etc. Collect the today's word to finish the challenge, you only have 12 hours to do it. Day 5+: Super Mystery Box! Play with your friends on facebook. Login to facebook: Get 5000 coins! How to reset your daily challenge or daily rewards instantly? You can reset your daily challenge or receive daily rewards without waiting!. You can get this cheat by changing your phone's time setting. Close your Run Forrest Run app by either restarting your phone or by killing it on your task manager. Open Run Forrest Run app and you will get instant daily reward or reset your daily challenge. 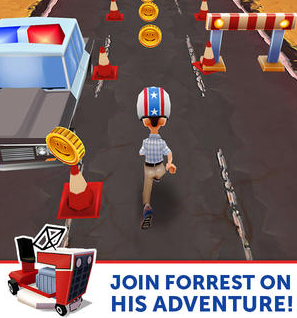 Open Run Forrest Run app but do not play a single game. Open Run Forrest Run app just to make sure that there is no problem. You should turn off your wifi/3G/4G internet connection before you launch the Run Forrest Run app. In-case you already open the Run Forrest Run app, just force close or press your multitask button and swipe it out.